Connecting people to wildlife in a positive way through knowledge and understanding, Hope for Wildlife believes that education through rehabilitation is the key to a sustainable future. 1. 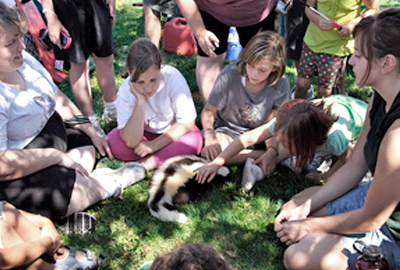 Rescue, rehabilitate, and release back into the wild injured and orphaned wildlife. Since 1997, we have rehabilitated and released over 40,000 injured and orphaned wild animals representing over 250 species. Animals we treat receive food, medicine, shelter, and whatever else is needed to ensure a successful return to the wild. 2. Educate others about the importance of conserving wild animals and the ecosystems that sustain them. Every year, we assist over 20,000 callers through our wildlife helpline, welcome thousands of visitors to our facilities for tours, and give hundreds of offsite presentations to community and school groups. 3. Research and develop the knowledge and understanding necessary for the conservation and management of wildlife. We collect a wide range of data from animals treated at our rehabilitation centre, which provides valuable insight into the health of local populations. Our work also offers opportunities to learn about the protection of various species in complex and continually changing biological, social, and political environments.